reconnXpedition2012 | . . . walking the inside out . . .
. . . walking the inside out . 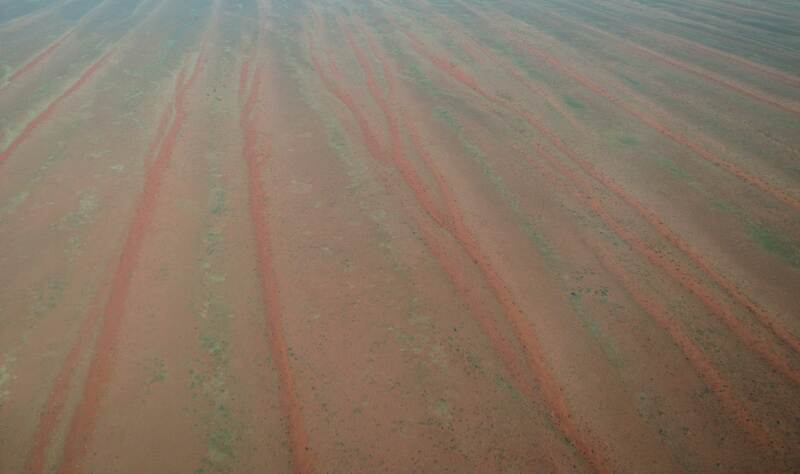 . .
reconnXpedition2012 was a walk in Australia’s Simpson Desert – that’s the big red splotch in the centre of Australia. It’s the world’s largest parallel sand ridge desert and is also the driest area on the Australian mainland. 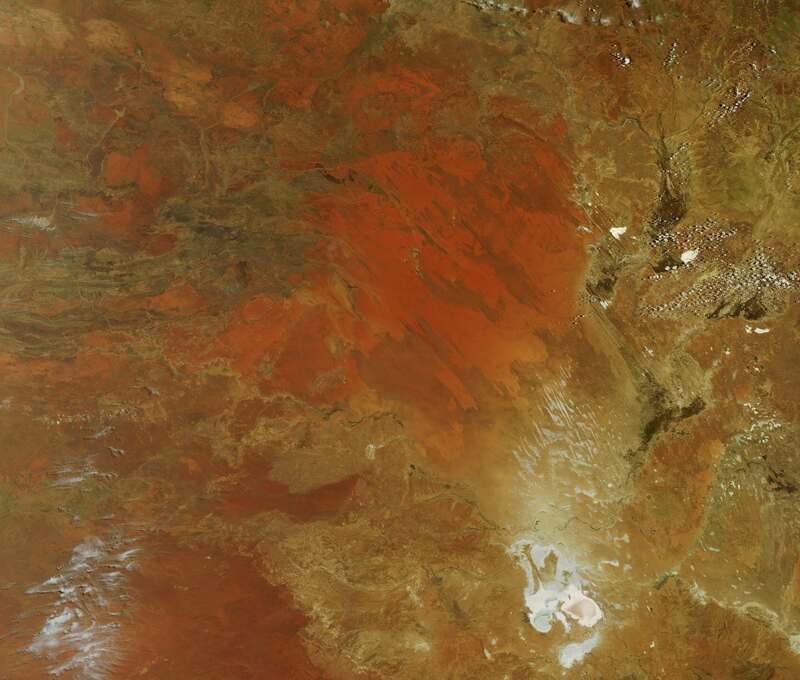 Lake Eyre – Australia’s largest salt lake and the lowest point on the continent – lies at the southeast corner of the great dune field and is shown at the bottom left of the photo below. Curiosity. And this leads to exploration. This journey was certainly not about setting endurance records or conquering the desert. It’s simply a walk in the landscape to see what lies over the dunes beyond the horizon. 20 pads, 2 feet walking – who’s coming with me? I walked with 5 of my professional four-legged colleagues, so it certainly was neither a solo trip nor unsupported, as they did most of the hard work. Meet TC, Istan, Sultan, Char and Morgan. The journey began on August 4th on the western side of the desert on Andado Station and finished 35 days and nearly 700kms later outside the Birdsville Hotel in Queensland. Here’s the expedition route. This journey was shared, connected via the digital world, from an ancient landscape in the heart of Australia to you, your friends at work or perhaps your school class. Had I done anything like this before? Sort of. Walking is what I do and I’ve calculated that during the last 16 years I have spent the equivalent of 3.4 years walking, living and exploring in the Simpson Desert on either scientific or commercial expeditions. I have walked across the Simpson eleven times since 1995 – always a different route and always cross-country. And always with camels. My only ‘solo’ trip in the Simpson was following the Tropic of Capricorn which bisects the northern part of the desert. On that trip in 1999 there was little time for exploring as I was on a mission to get across the continent and besides, the Simpson was in the midst of a drought so there was little feed for the camels – not a good place to hang around in. But I’d never walked & explored the Simpson by myself, so I actually hadn’t done this before. And now you can see how the whole journey went as I updated this blog regularly throughout the trip. If you are at school and would like your class to follow my journey visit Education Through Expeditions where you can access the reconnXpedition2012 profile and learn all about the Simpson Desert. Go to the Schools page to find out more. 8 of my 11 major walks right across the Simpson have been as a leader of commercial camel expeditions and all of these expeditions are contemporary explorations and all have cut new paths across the desert and no expedition has ever gone the same way twice. Those trips were great journeys – up to 22 packcamels, 4 cameleers and 12 trekkers – but the responsibility of leading such expeditions means that there is hardly any time for me to actually relax and experience the desert one-on-one. So I guess this trip is about my reconnection to country. Reconnection to the landscape without the demands of being an expedition leader. Some people like to drive across the desert or ride bikes or even run (there is no way I could do that! ), but for me, walking across the landscape with camels is pure desert exploration. So this is my journey – reconnection to my country, Australia. Thanks for dropping by! Welcome to my blog. This expedition has been partly funded and supported by over 55 desert connectors via the expedition Pozible crowdfunding project. ‘We shall not cease from exploration, and the end of all our exploring will be to arrive where we started and know the place for the first time’. It would be great if you could share me! Good luck Andrew, what a journey you are embarking on. You will be walking also for many of us who will never get there (the knees, joints etc) and we will be with you all the way! And you wll have time to remember those four footed friends you lost last year. I have just done a gentle Caring for Country trek north of Broome with the Goolarabooloo people – it was definitely not a solo trip but wonderful to again be connecting to the land of this wonderful country and to share it with the locals, both traditional owners and those who live in and support Broome and the Kimberley. All the best Andrew to you and those wonderful humps. Will be following your trip with interest as have been on 3 of your commercial treks and just love it. Can understand how you will enjoy doing it solo and not have to worry about anyone else. Thanks Dot. Not long to go now until departure! Regards, Andrew. Thanks Dawn! The Banj had better behave himself – as for Morgan, well he’s just about perfect isn’t he? Thanks very much for including me in your reconnXpedition2012 adventure. I am really looking forward to seeing and hearing about your adventures…particularly as my father David Marshall was the photographer on Cecil Madigans expedition in 1939. Hi Helen, thanks for the message and what a great connection your family has to the Simpson. Do you know Mark Crocker? As you know, his father was the botanist on the 1939 expedition and Mark has trekked with my company in the Simpson. Apart from Old Andado itself, I have never actually visited any of Madigan’s camps in the NT. I may visit one on my trip, although it is a reasonably popular 4WD route now, so I won’t be that keen to get too close. Yes, it is a great connection with the Simpson and I’d love to do one of your “commercial” trips one day for that reason, and away from the 4WD’s! I don’t know Mark Crocker and I just checked some of the photos I have of the Madigan expedition and there doesn’t seem to be a photo of his father, there’s one of Harold Fletcher with a snake around his neck! Most of the photos and a movie are kept in Canberra, I think. Thanks Helen. I’ve forwarded your message onto Mark. I look forward to showing you the Simpson via my walk this year and perhaps in future years on commercial trips. Cheers, Andrew. All the best for the walk/trek Andrew, I’m glad to hear youre heading out again with just you & the humps; i had to smile to myself at your mention of Poeppels Corner, my dear old Dad, who was an aust desert lover, made it there in his 80’s, on one of his trips and had a bit of a ‘poke around’ the surrounding area. Also at present is renewed discussion of Patrick White’s novel ‘Voss’, with the desert ‘front & centre’, based on the explorer Ludwig Leichhardt’s trip in 1848. I shall follow you with interest, Barb. Thanks Barb. Yes, I recently read about Patrick White and ‘Voss’. I have no doubt that one day, someone somewhere will find definite proof of Leichhardt’s Expedition. I’m not likely to find any trace of dear LL but you just never know what else may turn up out in the dunes. Andrew. ee as usual to base here if needed. Thanks Trevor. Hopefully I can be moved from junk to worthwhile. I like the term ‘stickability’! A. What do you hope to see this time that you’ve never seen before, Andrew? When’s the moment of greatest tension during preparation? Hi Inga. Well, I’ve never been to either Geosurveys Hill or the Geographical Centre of the desert, so that’s a start. Also, as all my commercial expeditions across the Simpson from west to east to Birdsville have steered well clear of any 4WD tracks, it will also be my first trip to Poeppel Corner with camels. It’s taken 16 years and 10 trips across the Simpson to finally try to get there. Then there’s all the country in between those points! Of particular interest to me will be a group of small claypans en route to GeoHill and also the finger of salt lakes that stream up from PCorner, as there is usually interesting things to look for in that sort of country, particularly artefacts. I will also cross the Hale and Plenty River channels. The massive floods of 2010 made their way deep into the desert and it will be fascinating to see how the desert ecology responded to that huge volume of water. Also, the bushfires from last October/November that burnt out huge areas . . .
You’ll have to keep tuned to the weekly blog updates! I’ll do my best to post photos of the different types of country as I pass through it. As you will see, the Simpson ecosystems gradually change as you walk from west to east. Like solo desert travellers before me, I also suspect that what will be revealed to me on this trip will come from my own thoughts & letting my mind wander over the horizon. As far as preparation goes, the biggest moment is when you actually leave home and start travelling to the expedition start point. It’s a HUGE relief to get on the road and a bigger relief to arrive at base camp with all the camels having travelled safely in the truck. Their welfare is my priority. Thanks for the questions. FIre more at me if you like! Thanks for checking out my site Niki. I am excited to follow your venture. Well done Andrew….a lot of work in setting all this up. Best wishes from Don and I. We will be following your blog. Thanks Janet! Preparation is the hard part, the walking will be far easier. I’m looking forward to seeing you off on your great journey and I wish you and your humps a wonderful trek. I am going to forward your email to some schools whose students may be able to follow your journey …as I will be doing.